What would you do if you won $5,000? Would you keep it — or donate it? A 10 year old West Woodland neighbor just won that amount, and he’s giving it all away to help the cheetahs at N/a’an ku sê in Windhoek, Namibia. Joris Hutchison was awarded the 2017 Gloria Barron Prize for Young Heroes, an award that includes a $5000 gift to be applied to the winner’s higher education or to their service project. Each year the Barron Prize honors 25 inspiring young people who have made a significant positive difference. Joris won the prize for his work to save cheetahs from the threat of extinction. He has raised more than $14,000 to purchase GPS collars that track and protect the animals, earning money by selling lemonade, flowers and t-shirts, and by organizing skating parties, and a garage sale. Joris donates all that he raises to N/a’an ku sê, a wildlife conservation organization and sanctuary in Namibia where he and his mother have volunteered for the past three summers. As the group’s youngest volunteer, Joris prepares food, cleans enclosures, and creates enrichment items for the cheetahs that live there, all of whom have been injured or habituated to humans. You can support Joris’ work and help the cheetahs in N/a’an ku sê: Donate Here! Watch Joris discuss his conservation work! 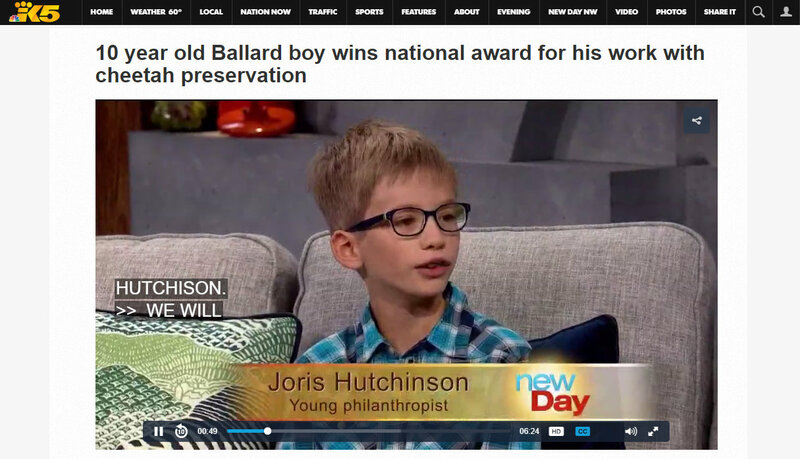 On October 3, 2017, Joris appeared on King 5’s New Day NW to discuss his prize and cheetah conservation work, which you can WATCH HERE. Screen shot of King 5 New Day NW website courtesy King 5.